What did you buy in the Steam Summer Sale? We're stocking up on games and we actually believe we're going to get around to playing them. - Which of your existing games did E3 2018 make you want to play? - What do you wish they'd announce at E3 this year? 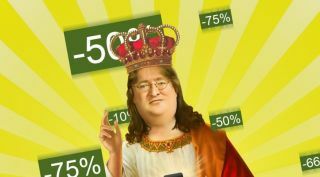 Lots of stores run big sales (itch.io's Summer Sale just concluded), but none have reached the meme status of Steam sales, which come with compulsory calls to throw our wallets in Gabe Newell's direction. As usual, we have done that. It's hard to resist all those games we were kind of thinking of getting when there's a friendly green "-78%" tag staring us down, saying, "You will definitely find time to play Crusader Kings 2, Europa Universalis 4, Stellaris, and Hears of Iron 4." If you pulled the trigger on any games during this week's sale, let's talk about them! This week's question: What did you pick up during the Steam Summer Sale? Even though I have the suspicion I'll be too impatient to deal with all its intricacies, I've had my eye on BattleTech for a while, and the latest set of updates convinced me the game is moving in the right direction. I've installed it, and will play it as soon as I have a spare moment. I've also used this Steam sale as an excuse to pick up expansions for Paradox grand strategy games that I'll definitely get around to playing at some point in the future, as well as Cities: Skylines' Green Cities expansion, which I've put off for a while because it looked less exciting than the Natural Disasters one. I think that's a fair criticism. My stupid brain says meteors are cooler than organic stores, at least when it comes to games. Ninja Pizza Girl and Horus Heresy: The Battle for Tallarn. The first is a cyberpunk platformer about trying to deliver pizza while ninjas from a rival firm bully you, which is close enough to Snow Crash to make me want to play it. The latter is a turn-based strategy game set in the Warhammer 40K universe and part of my doomed quest to play every Warhammer game no matter how mixed the Steam reviews. I haven't tried either of them because I am on holidays and was not even here. I completed my Valve collection for $0.98 by adding the original Left 4 Dead, which I probably won't bother playing but I have a bit of a collector mentality—got catch 'em all! Otherwise, my pile of shame is so large that I've wisely avoiding adding anything more to the mix. I had a sudden urge to play a bunch of fighters. Tekken 7 was still a little too steep for me but I did pick up Killer Instinct and Guilty Gear Xrd -REVELATOR-. The latter is a totem of raw, concentrated, batshit anime nonsense. There's a character in a coma who fights with a robot bed—his name is Bedman. There are several sky pirates, and one fights with a giant axe and summons fish to punch enemies. Why aren't all games like this? Killer Instinct seems pretty good too, and I particularly like the way the game simplifies combos into bursts of attack that you shape with relatively simple commands. I can't stop playing Guilty Gear for now though, because it's actually an excellent fighter with vibrant art and a clever conceit—it may look like a 2D fighting game, but the fighters are actually 3D models. When you perform special moves the camera breaks into the third dimension to sell the power of the attack. It looks and feels incredible. I bought a bunch of Hearthstone card packs for full price on Battle.net. Sorry. I didn't buy anything. You don't have to buy stuff just because Steam puts it on sale. If Steam jumped off a bridge, would you do it too? Naw, honestly, it's mostly because all the games on my wishlist, like SCUM, aren't for sale yet, let alone on sale. I'll just have to wait for the Steam Autumn Sale instead.